A RUNAWAY SUCCESS: Bon Jovi has sold more than 130 million albums worldwide since breaking out of the New Jersey club scene. Anyone with a radio knows Jon Bon Jovi is one of the most phenomenally successful rock stars of all time. Not so widely known are the inside stories behind the early ambition and rise to rock-n-roll riches that could only be told by those who were there. 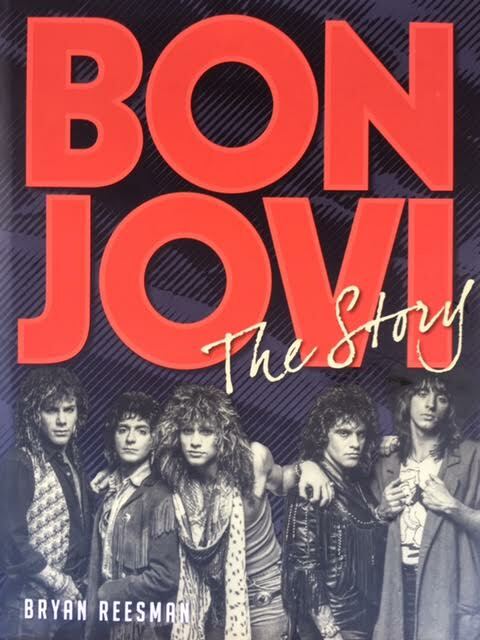 In his soon-to-be released “Bon Jovi: The Story,” (due Nov. 1 through Sterling) veteran entertainment journalist Bryan Reesman interviews early Bon Jovi band mates and associates Jack Ponti, Wil Hercek, Bill Frank and Bruce Stephen Foster, among others. We learn that Bon Jovi’s 1984 breakout hit “Runaway,” was co-written by New Jersey area musician George Karak and actually predates the band. We’re also informed that Aldo Nova played guitar on the single and sang backup vocals throughout Bon Jovi’s debut album (and remains a close friend and collaborator to this day) after the pair met at Manhattan’s famed Power Station Studios, owned by John’s second cousin Tony Bongiovi who hired the family’s aspiring rock star to fetch coffee and mop floors. Other insights? Four of the five future Bon Jovi members were delivered by the same doctor in Perth Amboy, New Jersey; Bongiovi changed his name to Bon Jovi (and shortened John to Jon) in an attempt to emulate Van Halen; and, according to Bon Jovi guitarist Richie Sambora, only Jon was technically signed to Mercury Records. The rest of the band members were (and presumably still are?) hired guns. 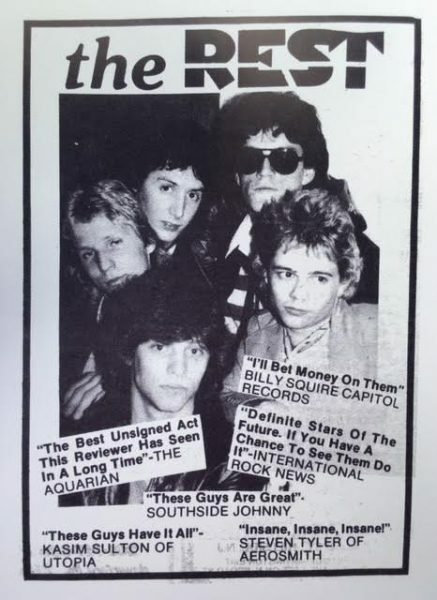 YOUNG GUN: A flyer advertising one of Bongiovi’s early bands. Young John is lower left. Reesman’s book is an unauthorized affair, but hardly lacking in credibility given the input from early inner-circle connections and such notables as Judas Priest singer Rob Halford; ex-Scorpions drummer Herman Rarebell; hit songwriter Desmond Child; music media personality Eddie Trunk; blockbuster music video director Wayne Isham; and music mogul Derek Shulman who all offer their unique perspectives on Bon Jovi the man and the band. Also included in the book’s 208 glossy pages are 130 color photos (including early promo shots, flyers and assorted memorabilia), sidebars outlining the outside pursuits and current whereabouts of past and current Bon Jovi band mates, as well as Jon’s forays into acting, philanthropic endeavors and humanitarian efforts. A success story like few others, “Bon Jovi: The Story” also reminds us that the Jersey kid who cut his teeth covering the J. Geils Band, the Asbury Jukes and Bruce Springsteen (who once joined an excited teen-aged Bongiovi onstage at an early bar gig) continues to do blockbuster business around the world 30 years after “Slippery When Wet” went stark-raving ballistic. How many of Bon Jovi’s “hair band” peers can say the same? Exactly! You can count them on half a hand (and even less if you combine album AND ticket sales). Fluidly written and exquisitely presented, “Bon Jovi: The Story” is a feel-good tale of rock-n-roll determination that’s impossible not to cheer. Full disclosure: Author Bryan Reesman and I have never met, but once were colleagues at Metal Edge magazine. BELOW: Before he was in heavy rotation as an internationally famous MTV superstar, young Bon Jovi was briefly in the Patty Smyth-fronted band, Scandal.